Dr. Katherine Rawlins is currently a physics professor and a chair of the physics department at the University of Alaska Anchorage. She studies cosmic rays using the data from the IceCube Neutrino Observatory, located at the Amundsen-Scott Pole Station in Antarctica. Dr. Rawlins has spent one year at the South Pole station in 2002 as a winter-over scientist working with IceCube project. I do a number of things. I teach, I am involved with IceCube research project, I study cosmic rays, and I am also the chair of the physics department. I love teaching, I hate grading, I love doing research with IceCube. Being chair of the physics department is hard, and it’s not what I was trained to do; I never learned how to be an administrator. But for the most part I like teaching and I like IceCube; it is an exciting project, and I wish there was more time to devote to it. What is the pie chart for the time you spend on those different tasks? The official pie chart is 3/5 teaching and 1/5 research and 1/5 something called “service”, which can be anything from being on committees to coordinating other instructors, all the miscellaneous stuff that needs to get done around the university that professors do. I not only lecture, but I also teach labs, and I have to do all my own grading. The University of Alaska Anchorage does not have graduate school for physics, so we don’t have teaching assistants. When I was in graduate school, I graded constantly! I graded on the bus on my way to work, I graded over the dinner table, I graded in my sleep. Seems like I did nothing but grading, such was the life of the graduate student teaching assistant sometimes. I’ve gotten a lot better at it with practice including my time as a professor. I can predict the mistakes the students are going to make, and I’ve gotten better at writing an exam that will be easier to grade. I don’t do multiple choice, hardly ever. Because physics is all about problem solving: it's the skill I'm trying to train them in, and I want to see their progression of thought written on the paper. Getting the right numerical answer is not as important as to see that they are setting up a problem and thinking through the solution, putting the pieces of the puzzle together. That’s the hardest thing about physics, the thing that most of my students struggle the most with, and what they complain about the most that’s hard and different from their other classes. "Long-answer" format also builds another skill, which is communicating something mathematically on paper: a clear progression of equations, and how to get from A to B to C. This is also an important skill if you are in any scientific field and trying to write a paper that communicates to somebody what you did. Have you ever had a role model in physics? Absolutely! I‘ve had many role models throughout the years. I was born in the 70's so I grew up watching the TV show "Cosmos" with Carl Sagan. I was captivated by that, as many young people of my generation were. I also had a series of awesome science teachers in high school and college, really excited, passionate instructors. My freshman college professor in particular. He didn’t teach from any book. He had his own concept of what was awesome about physics and he didn’t use any standard textbooks, he basically wrote his own out of his own brain. It was a course designed for physics majors who already had a very solid calculus background, a "level up" from the standard intro course that most students take. It started with 150 students in the big lecture hall. 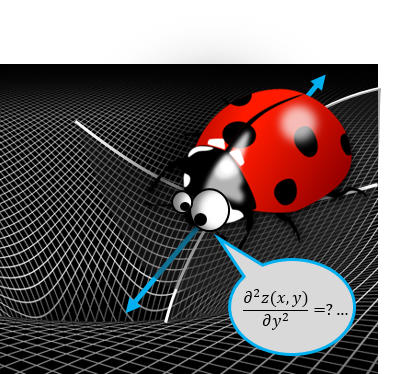 In the first week he presented this theory about how, if you were a bug living on a curved space, crawling around on this curved space but unable to leave it and get the view from above, you could determine the curvature of your universe, by measuring partial derivatives of spatial coordinates. I’d never seen a partial derivative before in my life, but it was the most awesome thing I'd ever seen! By the end of the second week the population of the course had dwindled to about 25 people. Everyone else had said: “This is crazy! I am singing up for a more traditional physics class instead.” The 25 of us that remained had quite a roller-coaster ride. I think I got a 33 on my first midterm, which really woke me up not only to what physics was like, but what college was like. I really started to work harder, because I did not want to get another 33. Being that upset about getting that bad grade, was also a sign that this was something important to me, important to be good at. Now that I am on the other side of the desk, I get a lot of students who are getting around 33 on my midterm and it is the first 33 they’ve ever gotten. I can say “I know how you feel and this is what you have to do to change it”. Did you know that you want to become a physicist from your childhood? I wanted to be either a marine biologist or an astronaut. Like many other little girls who grew up in Northern California, I got interested in marine biology because we get whale migrations that come up the coast, and there are seals and sea lions that hang out in San Francisco harbor. I was obsessed with whales and space. I had posters of the space shuttle and star-maps on my wall, and I drew pictures of whales constantly. I had no idea what physics was until I got to high school. By then I knew that to study biology I need to memorize a lot of things, and I knew I was not good at that. I was better at math, where you only need to memorize a few things and you can derive whatever you need. Furthermore, I’d researched the astronaut program enough to know that there are two kinds of astronauts: pilots and scientists. Most of the pilot astronauts are ex-military and I did not think that the military was for me. Scientist, then! But I was undecided about a major until halfway through my college career. It was a toss up between computer science and physics for a little while. But physics was the most mathematical and I knew I could use my math brain in that field. Was it a challenge to get accepted at Yale? I grew up in an upper-middle class neighborhood north of San Francisco and my parents are both computer professionals. So I grew up in a family of thinkers, college graduates who understood the value of education, understood math and science. We had a computer in the house, at a time when that was a very new idea. My parents shelled out a lot of money to send me to a fancy private high school. It did not have a football team. It was a place where I could really focus on school. It was always expected that I go to college, there was never any doubt of this. Was there any doubt about going to graduate school or not? When I was finishing up college, I was not sure if I would be good at the real world. I thought "Well, school is something I am good at, school is where I’ll stay." When I went to physics grad school, I did not know at that point what kind of physics I wanted to do. Physics is so broad! There are so many different kinds of subfields that are so different, from string theory to experimental fluid dynamics. I did not have a specialty in mind, so I chose a graduate school that was very broad and big: the University of Wisconsin-Madison. It's a huge place with a big physics department and lots of different research topics going on. How did you get involved with the IceCube project and what brought you to the South Pole station? I actually started out a first research position with X-ray astronomy. Eventually I switched to a neutrino project which was IceCube's predecessor: AMANDA (the Antarctic Muon and Neutrino Detector Array). I have to admit that I was drawn to the project with the allure of getting to travel to the South Pole myself, the possibility of adventure! So, even once I got to graduate school I still did not really know what I wanted to do. It took a while to figure it out. Have you ever had to choose between career and family? No. No kids, and I did not get married until I was already a faculty member in Alaska. The whole trip up the professional ladder: school, grad school, postdocs, faculty member, I could move wherever I had to move to follow the job, including that year in Antarctica. Most of that winter crew were single people; a few had significant others on the ice with them, and a very few had left a family behind to take that job, and it was hard for them. There is Internet at South Pole, but it is not fast and it’s not available all day. It is available when there is a satellite visible close to the horizon, for a few hours a day. There are also satellite phones, but they are expensive to use. I was glad to be unattached. New people. Is it true that you start to be afraid of new people after spending the winter at the station? Different people have different reactions to the arrival of new people after the winter. Some people just went and hid, not wanting to talk to new people. Others saw it as a reason to celebrate. During the winter isolation, there is very little illness. But new people bring new germs, so it’s very common for many of the over-winter people to get sick right after new people arrive. The first plane also brings lots of fresh fruit and vegetables. Everybody gorges on fresh fruit and often there is a bout of gastrointestinal distress on the first day from eating too much fruit. For me having new people arrived was joyful at first, because there were new faces to talk to. But very quickly the new people started to undo all of the homely transformations that we had made to the station to make it our home for eight months, putting things back "where they were supposed to be", which threw me into an irrational rage. When I talk about it now it seems silly and stupid, but at the time it felt as if a bunch of strangers came over to your house for a party, and the party was very fun, but as soon as it was over they moved in, rearranged your furniture, set things up the way they wanted and made you live in the garage. Social life between Antarctic stations? The nearest other station is hundreds of miles away, so visitation is not possible. But on Fridays we played "radio darts" with McMurdo and Scott Base. Each party has a dart board in their comms room and we would all get on the radio and play darts: you throw a dart at your own dart board and you get on the radio and say “we got sixteen” and both parties would record the scores and the teams go back and forth like that. The point of it was to have some social experience with someone other than your own crew. Once, in the middle of the night in June, we got a radio call from Vostok Station, which is a Russian Antarctic station located near the Geomagnetic Pole, even more in the middle of nowhere than South Pole Station is. I happened to be passing through the comms building, and listened in. The guy on the other end could speak a little English, but it was broken and slurred, and we eventually learned through the language barrier that it was their radio operator’s birthday and they were having a big party in their radio room. They thought it would be fun to call South Pole and to say hello. Our radio operator was a woman, and apparently Vostok's winter population was all male. So they were not only drunk, they were unbelievably delighted to be chatting with a woman, to hear a female voice on the radio. They asked us, “How many women are at your station?” When we said there were twelve women, they said, “Oh! That’s wonderful! We have twelve people! We offer a midwinter greetings to all the women!” Through the broken English and unintelligible Russian, it was clear that they were having a great time, and so were we. The flights to Antarctica come and go from Christchurch, New Zealand, where it is summertime. You get off the plane and the air is moist and warm. Your senses are assaulted by aromas: flowers in bloom, car exhaust, and the food from restaurants. Christchurch has a beautiful botanical garden so people go there to just smell the grass, smell the trees. The local residents of Christchurch are really great. Every year at about the same time (October and November), planes show up full of sun-starved confused Americans, who are doing weird things like smelling trees. Many have forgotten the basics of how society functions, such as that you have to pay in a restaurant, or that you don’t have to do your own dishes there. I had forgotten all of my ATM PIN numbers, so I had trouble getting money. But Christchurchians are patient with us, and it takes a few weeks to readjust. What was the gender ratio in your undergrad and grad school? Women physics majors in college were about 1 in 10, in grad school it was a little better, may be 1 in 8. Nowadays, I see about 1 in 4 in my introductory engineering physics classes. At South Pole by the way, the ratio there was about 1 in 6. One thing to keep in mind about the South Pole, is that not everybody there is a scientist; there are also the IT people, cooks, a doctor, all sorts of technicians, administrators, somebody needs to run the power plant, fix the plumbing, we had lots of construction people in our crew... all kinds of different people from all kinds of different backgrounds, not just science. You would think the ratio would be a little more even, but it’s still kind of uneven. It surprises lots of people who went down there. “Oh my God, there so few women here”. But for me, coming from a physics department, it was perfectly normal, if not better, than what I was used to. It's sad that old school attitudes about women and women in physics in particular still persist. One bad experience can drive a student away forever. But I’m optimistic, because over time young people come in with modern attitudes, and they in turn can be those role models to students. We have other female faculty at UAA. The physics department has 2 women out of 5 tenure-track professors, and elsewhere in the sciences the percentage is near 40 or 50 percent. As I walk the halls of the integrated science building there are a lot of female faculty. Empty space is not really empty. It is full of subatomic particles flying around. All kinds of particles: bits of atoms, electrons, protons, and photons, and neutrinos. Here at Earth we can collect all of these particles as they come from the sky and use all of this information to study astronomy. Most astronomers use the photons (the light) with a telescope, the most straightforward way. But other particles are arriving here too bringing the information with them. The IceCube Observatory is a cubic-kilometer-sized particle detector, which records the passage of charged particles in all directions. The scientists in this project are looking at all kind of the different things using this instrument. Some are looking for neutrinos, which are neutral particles that are going through matter without leaving a trace of their presence. They are very difficult to detect. A detector can detect a neutrino only if it crashes deep into the nucleus of an atom. Those collisions are very rare and we need a very large detector to catch a substantial number of them. The main mission of this telescope is to find those neutrinos and to study what kinds of explosive and energetic objects in the universe might generate them, like active black holes, gamma-ray bursts, and other faraway objects where there are very high energy particle collisions. I myself study cosmic rays, which are charged particles that fly around in the universe and they can generate signals in our detector as well. In fact, most of the signals we see are from the cosmic ray air showers. The neutrino people need to filter out all of that cosmic ray junk in order to find their rare neutrinos. But there are scientists in IceCube project that study what the neutrino people call “junk”, the cosmic ray events themselves, to try to learn what the cosmic rays are. What are their energies? How heavy are they: are they lightweight particles like a proton or are they heavy like an iron nucleus? The answers are the clues to figure out how these particles were made, where they were created, and how they propagate through the universe to get here. After the completion of the South Pole winter, Katherine applied to NASA's Astronaut Program, but got rejected due to imperfect eyesight. Even though she hasn't fulfilled her dream of becoming an astronaut, she describes how the pursuit of this dream has led to an interesting and adventurous career.